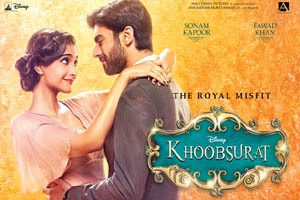 Khoobsurat is a 2014 Bollywood romantic comedy film directed by Shashanka Ghosh and produced by Rhea Kapoor, Anil Kapoor and Siddharth Roy Kapur. It stars Sonam Kapoor, Fawad Afzal Khan, Kirron Kher, Ratna Pathak and Aamir Raza Hussain in lead roles. The music of Khoobsurat was composed by Sneha Khanwalkar, Badshah. The lyrics were penned by Ikram Rajasthani, Badshah, Amitabh Verma, Sneha Khanwalkar, Sunil Choudhary, Kumaar. Here is the link of all the songs lyrics and videos of Khoobsurat.